The dependability of the Orvis fly fishing reputation is aptly demonstrated in all of their fly reels. Orvis is a name traditionally associated with quality fly fishing and sporting equipment. Match your new or trusty old favorite Orvis fly reel with an Orvis Helios 2 fly rod and get out on the water with equipment you can count on anywhere, anytime. chasing fish of every imaginable size and name. If Orvis sells it, you can count on it to perform. Saltwater or Fresh, one of these Orvis fly reels will earn a place at your side, on your favorite fly rod. Drag systems: Some Orvis drag systems are as simple as a click drag, and some utilize the latest technology in sealed carbon fiber and stainless steel components. You can count on Orvis fly reels to employ the proper drag system on each reel, and at very attractive prices with excellence incorporated into every reel model. 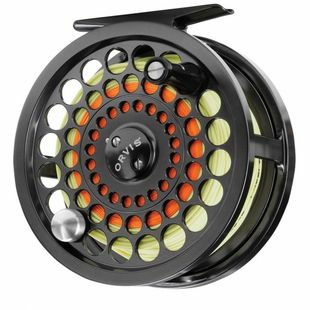 The Orvis Access Mid Arbor reel series is new for 2013, is a good twenty percent lighter than previous Orvis Mid Arbor designs, and features fully sealed drag systems on reels that range from a tiny 1 to 3 wt up to a hefty reel suitable for 9 to 11 wt fly lines. Fly Reel Quality: Orvis is a company with decades of well earned performance reputation. This reputation includes the assurance that Orvis will be in the game for the long run, and they stand behind every product they sell. Defects, and these are RARE, are covered by a full replacement guarantee. Wear and tear, damage caused by the normal events of the day like falling down a streamside trail, will be repaired at an official Orvis repair facility. One way or another, you can count on Orvis and the Caddis Fly to provide top-flight customer service and a fly reel you can count on. Availability of Orvis Fly Reels: If you do not see the Orvis fly reel you are seeking listed here in our online catalog, please shoot us an email or call the Caddis Fly Shop, because it is likely that we can provide any Orvis fly reel, either from our Shop inventory or by special order. We are constantly and routinely receiving shipments from Orvis, so chances are good that we can provide the Orvis products you have on your shopping list. NO SALES TAX and FREE SHHIPPING on the vast majority of Orvis products.